"I received this buttermilk-sugar cookie recipe from a friend in Shipshewana, IN which has a large Amish community. A beautiful place to visit!!!" In a large bowl, cream together the shortening and white sugar until smooth. Beat in eggs one at a time, and stir in vanilla. Combine the flour, baking powder, and baking soda; stir into the creamed mixture alternately with the buttermilk until a soft dough forms. Drop by teaspoonfuls onto prepared cookie sheets. Bake for 10 minutes in preheated oven, or until light brown. Cool on wire racks. In a medium bowl, blend together melted butter and confectioners' sugar until smooth. Gradually stir in milk until frosting reaches the desired consistency. Mix in food coloring, if desired. Spread onto cooled cookies, and place frosted cookies on waxed paper or cooling racks until frosting is set. These were more like little cakes than cookies. A bit bland as well. I added melted chocolate to part of the batter to flavor it up! 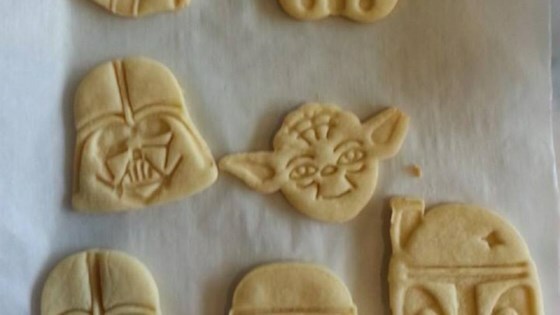 Sorry, but these cookies were so bland. I can't believe they got such high ratings. The BEST sugar cookie I've ever had! I'll never use another sugar cookie recipe!